No one called it World War I at the time—for it did not seem possible there could ever be a second. Instead, they called it the “Great War” or the “War to End All Wars.” In a little over four years of combat, more than 70 million soldiers were mobilized around the world and over 9 million were killed. Finally, German officials signed an armistice in November 1918, and on the 11th hour of the 11th day of the 11th month, the ceasefire began and hostilities ended. 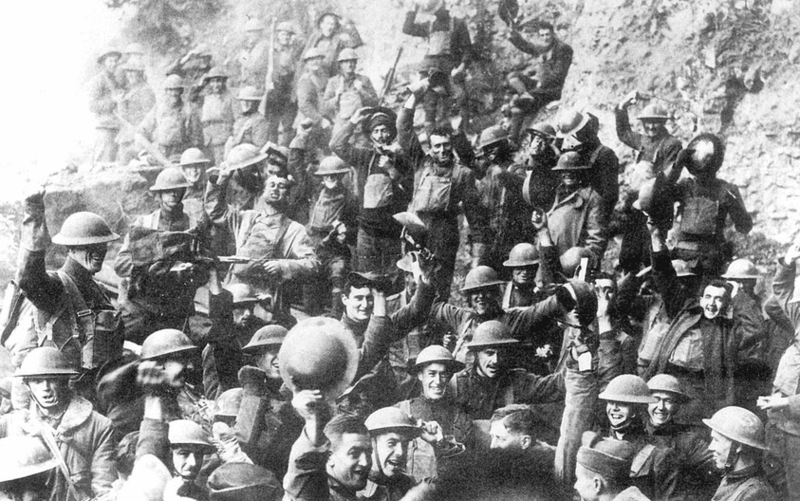 Photo: American soldiers of the U.S. 64th Regiment, 7th Infantry Division, celebrating the news of the Armistice, 11 November 1918. Source: U.S. National Archive; Wikimedia Commons. WWI irrevocably changed the world. It ushered in the era of modern warfare, with such innovations as tanks, chemical weapons and airplanes. It destroyed two powerful empires, the Austro-Hungarian and the Ottoman, and the Russian Empire was torn down by revolutionary forces that eventually led to the Soviet Union. Germany was shackled, causing resentment that helped fuel the rise of Hitler and the Nazis. After the conflict ended the world’s map was redrawn, especially in Central Europe and the Middle East. Despite the conviction of many that the “War to End All Wars” had taught humanity a lasting if distressing lesson (and the League of Nations was formed to implement this lesson), WWII began just 21 years later. 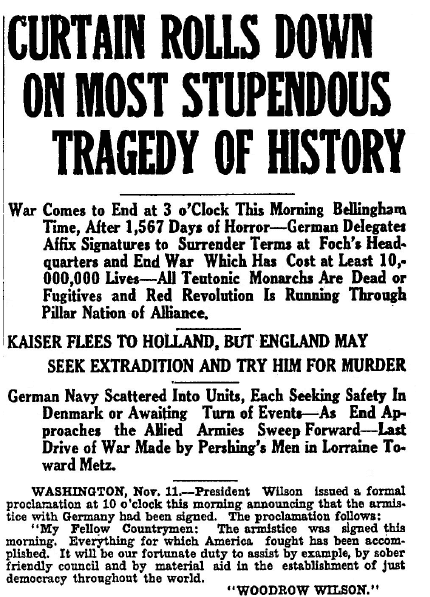 The signing of the armistice ending WWI was, of course, huge news all around the world, as shown by this front page newspaper article. Do you have any family stories about your ancestors who fought in, or were affected by, World War I? Tell us about them in the comments section.